Efficient Accounting Workflows is one of the topics that is near and dear to my heart. I feel like accounting should be an efficient part of every business and should be doing more good for your business than bad. So, we decided to have this as a topic for a recent #QBOchat. If you’d like to read the transcript, you can find it here. Full disclosure: We had some inspiration for this chat. We used the book, Bookkeeping Essentials (Affiliate link), by Steven M. Bragg to help come up with the questions and to help source some of our answers for the chat. Q1: What are the preferred workflows when it comes to invoicing and collections? Now, if you have sales on the spot, you can always just use the Sales Receipt form because it combines an invoice and payment in one! So many of our participants also mentioned that you should work to get paid upfront so you don’t have to spend time worrying about collections. You can work off of a retainer or you can setup a fixed price agreement so there is no worry about how much your customers will be paying. We know it isn’t always possible to get paid up front for everything. Not all businesses work the same! QuickBooks Online still has tools to help you be able to collect on your invoices. For example, you can use QuickBooks Payments so that your customer can pay quickly via credit card or an ACH transfer. And remember to setup a collections schedule so that you can consistently follow-up with customers that have open invoices. If you consistently have problems with late payments, consider offering a discount to customers if they pay quickly. But make sure you are still protecting your business. Have a stop work policy in place for customers that are bad payers. For the bookkeepers and accountants out there helping their clients with invoicing, make sure to document the process to increase your efficiency. @QBOPro Invoicing can be so different from one client to the next, make sure to document all procedures to follow. Q2: What are the preferred workflows for the purchasing process? If you are going to pay for something on the spot with a check, use the check form instead of the bill form. It combines the bill and record bill forms in one. There are plenty of great features in QuickBooks Online that help make purchasing more efficient. You can also utilize several different Apps that integrate with QBO to help make this process even easier. Here are a few recommendations from our community. @jamiemcdonald @Hubdoc, @ReceiptBank and many others create AP items in QBO with source docs attached. Bingo! @vheckman After using an app like @Hubdoc @ReceiptBank, just match match match in the banking tool. No data entry! To create an internal control structure in your business, consider using purchase orders internally for purchasing and require approval prior to any money being spent. Also consider having a petty cash process where it is controlled by one person and keep the cash on hand to a minimum. Make sure the person in charge is documenting all uses of cash and reconcile this account monthly by a different person in the business. Q3: What are the preferred workflows for payroll processing? I think the entire community was in consensus when we said “Don’t do payroll yourself!” There are a ton of products out there that will calculate the payroll taxes for you and they range in the types of services they provide from the minimal to a full-blown HR solution. @QBOPro AMEN! RT @accountingpeace @QBOchat – Outsource to the payroll experts if possible! One App that was mentioned over and over again was one of our amazing sponsors, @Tsheets. Their App is a time tracking system that helps protect your business from time fraud and has numerous controls in place. They also have a bunch of tools that help your employees, which is why their motto is “We love employees”! @ChristineGalli Love the approvals, the overtime rules and the reminders to clock in/clock out for payroll oversight outside of QBO. Did we just mention fraud? Yep! Payroll is a hot spot for fraud in a business. Have controls in place for time entry, but also put controls in place for processing payroll and make sure to separate duties or have an approval process in place. You can also consider setting up a separate payroll account to separate the funds. @BizBooksCloud Lastly transfer the money for the entire payroll cost to the dedicated payroll checking account and leave it there! And remember to reconcile your payroll accounts monthly. Just because someone else is calculating your payroll, you still want to make sure all the money is going to the right places. Q4: What are the preferred workflows for cash management? Match transactions from the bank to what is in QBO. If you have any differences, those should be investigated and cleared. It is clear that our audience loves QuickBooks Online’s banking feature. 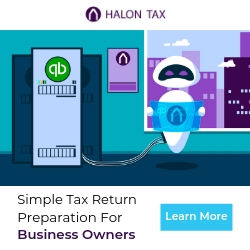 You are able to directly connect QuickBooks Online to your banks and get a feed of all the transactions that occur. Here are some comments from our community. @Hubdoc Real-time bank rec dramatically improves cash flow because you have visibility into your AP and AR. Stay on top of it. It is imperative to reconcile your bank accounts monthly and you should use the reconcile feature in QuickBooks Online to do this so you can lock down reconciled transactions. Make sure you are separating the tasks of those that send out the checks, make deposits, and reconcile your bank account. Separation of duties is key! Also keep an eye out for the Undeposited Funds account. It is a place where money can get lost in your books. You may record a payment being received, but until it clears the bank, you really aren’t able to use that cash. Since Undeposited Funds is an asset account, it can easily be overlooked because businesses tend to look at their Profit & Loss Statement more than their Balance Sheet. Q5: What are the preferred workflows for inventory management? First, you want to determine the method of inventory your business will be using and how you will be reporting your cost of sales. 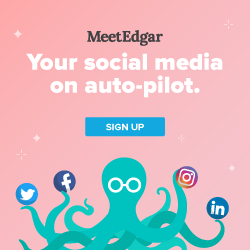 Find a process that best fits your business’s needs. Like payroll, so many of our community members suggest using a third-party App. SOS Inventory was definitely mentioned over and over again. @Kimtuitive Call in @sosinventory – only way to go with @QuickBooks Online + Advanced #Inventory needs! 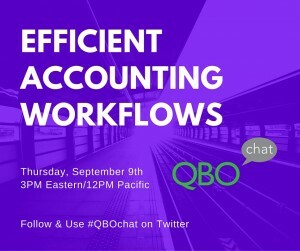 That wraps up our #QBOchat on Efficient Accounting Workflows. What do you think of the suggestions from our community? Leave your comments and thoughts below to keep the conversation going. And don’t forget to join our weekly tweetchat every Thursday at 3PM Eastern/12PM Pacific.